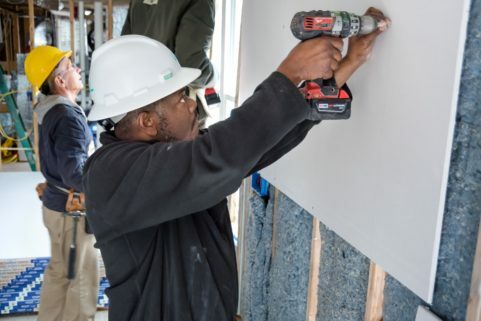 Whether you’re a skilled crafts-person or you’ve never picked up a hammer, volunteering with Habitat NOVA offers you a meaningful way to help families build strength, stability, and self-reliance through affordable home ownership in Northern Virginia. Below are some of our rewarding individual volunteer opportunities. 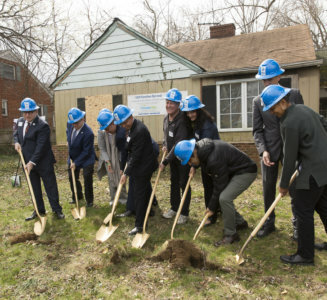 Many thanks in advance for dedicating your time and talents to Habitat for Humanity of Northern Virginia! We hold Community Build Days for individual volunteers two to three days a month. Volunteering at a Build Day is a full day experience and you are asked to commit to the entire day (8:30 am to 3:00 pm). Click the button below to sign up on our VolunteerHub site and receive updates on Habitat NOVA’s upcoming Community Build Days. All volunteers must be 16 years or older to volunteer on the construction site. Love to shop, organize, or talk with people? Volunteer with us at the Habitat NOVA ReStores! Volunteers help organize inventory, price donations, assist customers with finding items, create or improve displays, and much more! We need ReStore volunteers seven days a week. Habitat NOVA operates two ReStores, one in Alexandria and one in Chantilly – with proceeds from sales benefiting our programs supporting affordable home ownership. Each ReStore sells used and surplus building and home improvement materials, household items, and furniture at a fraction of retail prices. Not only are ReStore customers shopping at the store “that builds homes”, they are helping divert quality items from ending up in landfills. ReStore volunteers must be at least 16 years old. Volunteers ages 16 to 17 years old must have a ReStore waiver signed by a parent or guardian, but may volunteer on their own. If you have professional skill sets in office administration support, community engagement, and communications, we need your time and talents! We’d love to talk with you about the many special events and projects underway. If you’re interested in becoming a special event or office volunteer, please sign up by clicking the button below and we’ll be in touch soon. If you have any questions, please email our Volunteer Coordinator, Liz Salter, at [email protected].